Do you understand the American climate debate? Did you ever want to laugh at it? Here it is, in all its absurdity. 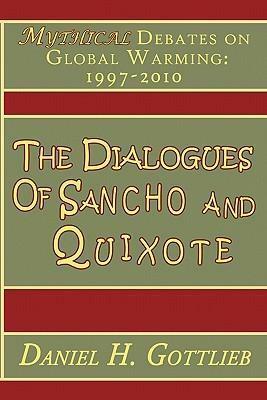 Sancho and Quixote made their debut in 1997. SANCHO: "So where are you off to, Quixote?" QUIXOTE: "We're closing down our offices in the great state of Louisiana. I'm selling some real estate and liquidating some assets--that kind of thing." SANCHO: "Why are your friends selling their real estate holdings in New Orleans?" QUIXOTE: "I didn't say that." SANCHO: "Did your address get given out to Greenpeace?" QUIXOTE: "Nope. All I can say, Sancho, is one of the boys from Bermuda Biologicals got a little too loud in a Karaoke bar the other night and so I'm off to liquidate assets." SANCHO: "Something going to happen I should know about?" QUIXOTE: "Where? What do you mean?" QUIXOTE: "There is nothing we can do to cope with global warming. We must stay the economic course." SANCHO: "First, you say we cannot modify our economic system." SANCHO: "Because it is fragile." SANCHO: "Then you say that when our economic system is battered by climate change, its resiliency will carry us through the tough times." SANCHO: "But we can't adjust its course when it is healthy?" QUIXOTE: "Now you have it, Sancho." SANCHO: "Why are you adding baseball base bags to the ocean?" QUIXOTE: "Look, I do as I am told. They said the ocean was getting too acidic and I should add some bases to it." SANCHO: "You are one funny lackey, Quixote. Are you sure they said bases? As in the plural?" QUIXOTE: "You mean I should just add first base? What difference does it make? You environmentalists are so picky."